"This chicken is cooked in the pressure cooker and then put under the broiler for a few minutes to crisp the skin. It is quick and easy, flavorful, and delicious! You can also make a nice sauce with the 'drippings' afterwards." Pour 2 teaspoons olive oil into the pressure cooker to coat the bottom. Arrange onion rings, carrot slices, and lemon slices in the bottom of the pressure cooker. Pour vegetable stock over onion mixture. Season the entire chicken with salt and pepper by using your hands to pat the salt and pepper into the skin. Place garlic head and thyme sprigs into the cavity of the chicken. Mix Marsala wine, brown mustard, minced garlic, chopped fresh thyme, celery seed, and dried parsley together in a bowl. Slowly stream 1/4 cup olive oil into wine mixture while continuing to whisk wine mixture until rub is emulsified. Spread about 3/4 of the rub over the entire chicken using your hands. Place chicken in the pressure cooker. Pour remaining rub over the chicken. Place lid on the pressure cooker, seal, and cook chicken under high pressure, 16 to 20 minutes. Release pressure according to manufacturer's instructions for quick-release. An instant-read thermometer inserted into the thickest part of the thigh, near the bone should read 165 degrees F (74 degrees C). 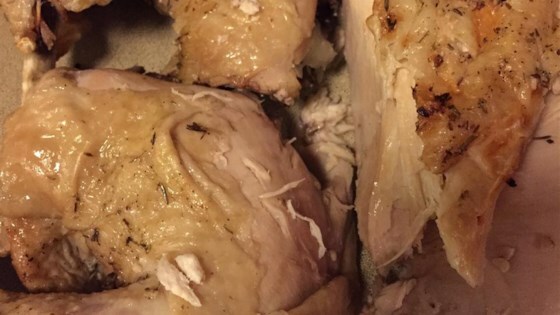 Place chicken in a roasting pan. Ladle about 1/2 of the liquid from the pressure cooker over the chicken. Broil chicken in the preheated oven until skin becomes golden brown, about 5 minutes. Remove garlic head from the cavity of the chicken. Squeeze the garlic cloves out the skins into a bowl and mash. Skim excess fat from the liquid in the pressure cooker and remove onion, carrot, and lemon and discard. Place pressure cooker over medium heat; cook and stir the liquid until browned, 2 to 4 minutes. Whisk mashed garlic into the browned sauce; season with salt and pepper. Serve sauce alongside chicken. See how to make a simple roasted chicken that’s very moist and flavorful. I submitted this recipe and made it again to "test" it. It is still really, really good! It's easy and a good choice when having company! I had almost all ingredients- i did sub dry thyme, in lieu of fresh and chicken broth in lieu of vege broth and Dijon mustard instead of brown- still turned out perfect.